(Nanowerk News) Physicists at JILA have for the first time observed chemical reactions near absolute zero, demonstrating that chemistry is possible at ultralow temperatures and that reaction rates can be controlled using quantum mechanics, the peculiar rules of submicroscopic physics. The new results and techniques, described in the Feb. 12 issue of Science ("Quantum-State Controlled Chemical Reactions of Ultracold KRb Molecules"), will help scientists understand previously unknown aspects of how molecules interact, a key to advancing biology, creating new materials, producing energy and other research areas. The new JILA work also will aid studies of quantum gases (in which particles behave like waves) and exotic physics spanning the quantum and macroscopic worlds. It may provide practical tools for "designer chemistry" and other applications such as precision measurements and quantum computing. JILA is a joint institute of the National Institute of Standards and Technology (NIST) and the University of Colorado at Boulder. A NIST theorist at the Joint Quantum Institute, a collaborative venture of NIST and the University of Maryland, also contributed to the research. "It's perfectly reasonable to expect that when you go to the ultracold regime there would be no chemistry to speak of," says NIST physicist Deborah Jin, leader of one JILA group involved in the experiments. "This paper says no, there's a lot of chemistry going on." "We are observing a new fundamental aspect of chemistry—it gives us a new 'knob' to understand and control reactions," adds NIST physicist Jun Ye, leader of the second JILA group involved in the research. 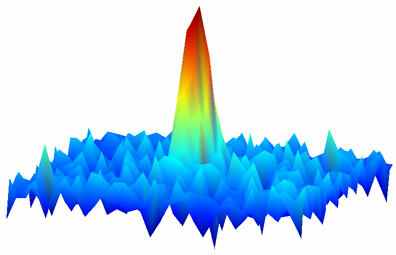 The Science paper is a follow-up to the same research team's 2008 report of the first high-density gas of stable, strongly interacting ultracold molecules, each consisting of two different atoms bonded together (see www.nist.gov/public_affairs/releases/ultracold_polar_molecules.html). Ultracold molecules are a hot research area because they may offer more diverse insights and applications than ultracold atoms, which scientists have deftly manipulated for more than 20 years. Scientists have long known how to control the internal states of molecules, such as their rotational and vibrational energy levels. In addition, the field of quantum chemistry has existed for decades to study the effects of the quantum behavior of electrons and nuclei—constituents of molecules. But until now scientists have been unable to observe direct consequences of quantum mechanical motions of whole molecules on the chemical reaction process. Creating simple molecules and chilling them almost to a standstill makes this possible by presenting a simpler and more placid environment that can reveal subtle, previously unobserved chemical phenomena. By precisely controlling the ultracold molecules' internal states—electronic energy levels, vibrations, rotations and nuclear spin (or angular momentum)—while also controlling the molecular motions at the quantum level, JILA scientists can study how the molecules scatter or interact with each other quantum mechanically. They were able to observe how the quantum effects of the molecule as a whole dictate reactivity. This new window into molecular behavior has allowed the observation of long-range interactions in which quantum mechanics determines whether two molecules should come together to react or stay apart. Thus the JILA work pushes the field in new directions and expands the standard conception of chemistry. The JILA quantum chemistry experiments were performed with a gas containing up to 1 trillion molecules per cubic centimeter at temperatures of a few hundred billionths of a Kelvin (nanokelvins) above absolute zero (minus 273 degrees Celsius or minus 459 degrees Fahrenheit). Each molecule consists of one potassium atom and one rubidium atom. The molecules have a negative electric charge on the potassium side and a positive charge on the rubidium side, so they can be controlled with electric fields. By measuring how many molecules are lost over time from a gas confined inside a laser-based optical trap, at different temperatures and under various other conditions, the JILA team found evidence of heat-producing chemical reactions in which the molecules must have exchanged atoms, broken chemical bonds, and forged new bonds. Theoretical calculations of long-range quantum effects agree with the experimental observations. In conventional chemistry at room temperature, molecules may collide and react to form different compounds, releasing heat. In JILA's ultracold experiments, quantum mechanics reigns and the molecules spread out as ethereal rippling waves instead of acting as barbell-like solid particles. They do not collide in the conventional sense. Rather, as their quantum mechanical wave properties overlap, the molecules sense each other from as much as 100 times farther apart than would be expected under ordinary conditions. At this distance the molecules either scatter from one another or, if quantum conditions are right, swap atoms. Scientists expect to be able to control long-range interactions by creating molecules with specific internal states and "tuning" their reaction energies with electric and magnetic fields. The JILA team produced a highly dense molecular gas and found that, although molecules move slowly at ultralow temperatures, reactions can occur very quickly. However, reactions can be suppressed using quantum mechanics. For instance, a cloud of molecules in the lowest-energy electronic, vibrational and rotational states reacts differently if the nuclear spins of some molecules are flipped. If a cloud of molecules is divided 50/50 into two different nuclear spin states, reactions proceed 10 to 100 times faster than if all molecules possess the same spin state. Thus, by purifying the gas (by preparing all molecules in the same spin state), scientists can deliberately suppress reactions. The JILA experimental team attributes these results to the fact the molecules are fermions, one of two types of quantum particles found in nature. (Bosons are the second type.) Two identical fermions cannot be in the same place at the same time. This quantum behavior of fermions manifests as a suppression of the chemical reaction rate in the ultralow temperature gas. That is, molecules with identical nuclear spins are less likely to approach each other and react than are particles with opposite spins.